Strong economic and population growth and a tight rental market mean Tauranga remains an appealing option for investors, writes Miriam Bell. How times have changed for Tauranga. Long perceived as a sleepy seaside settlement or even a retirement village, the city has evolved into a bustling metropolitan hub. 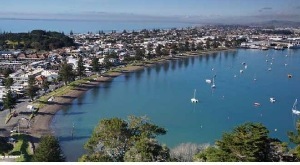 It is now New Zealand’s fifth largest city and one of the fastest growing areas in the country. Tauranga's population has soared by 10.8% over the last five years - reaching an estimated 135,000 this year. At the same time, the development of the Port of Tauranga has transformed the city, opening it up as a business centre and driving ongoing commercial investment in the area. Tauranga has also benefitted from Auckland’s runaway housing market boom in 2015-2016. Many Aucklanders, and in particular young families, have relocated to the city in search of more affordable housing and the lifestyle attractions on offer. One consequence has been that, like Auckland, Tauranga’s house prices skyrocketed. For investors, this means that affordable prices are no longer on the cards. Yet the city remains an attractive proposition for investors - thanks to its strong economic growth, quality tenant pool and tight rental market. In recent years, Tauranga has seen stellar house price growth, with the city’s average property value climbing to around $700,000. But, again following in the footsteps of Auckland, that growth has now slowed. It’s not declining though, rather it remains modest. QV’s November data shows Tauranga saw three month growth of 1.2% and annual growth of 3.9%. This left the city’s average value at $713,859 in November, as compared to $709,746 in October and $687,310 in November 2017. The latest REINZ data tells a similar tale. It has Tauranga’s median price at $667,500 in October. That’s up by 5.6% from September and by 13.1% on the same time last year. But the REINZ data also shows that sales activity is on a downward trend, with sales in October down by 11.9% on September and by 21% year-on-year. There are now more buying opportunities in the market than there were two years ago, Tolley continues. That’s because quite a lot of new builds in areas like The Lakes in Pyes Pa West and Papamoa have come on to the market. The scope for price growth might be changing, but investors we spoke to remain confident in the market. Aroha Tahau and her partner have three properties in Tauranga - two in Mount Maunganui and one in Papamoa. She says that, after buying their first property in 2014, they got lucky with timing. According to Tauranga City Council’s latest CVs, they have had 54.9% growth on their first property, 47.5% growth and 11.9% growth on the third in the six months since purchase. It’s that strong growth which is generating confidence in Tauranga. The impact of the port, which is now New Zealand’s largest when it comes to imports and exports, can’t be underestimated. But businesses of all sorts are relocating to the city and tourism is booming. There is a great deal of residential and commercial development, along with supporting infrastructure work going on. New sub-divisions are being built in areas like Pyes Pa, Te Tumu West, and Otumoetai. The CBD is being redeveloped, Tauranga Hospital is expanding and the University of Waikato’s new Tauranga campus is nearing completion. Large-scale projects like the Southern Pipeline and the development of Vessel Works, which is a marine servicing hub, and a marine research and education facility for the University of Waikato are also underway. The region’s kiwifruit industry is also thriving. All of this has been good for jobs and the economy: both Tauranga’s employment growth and GDP growth figures are significantly higher than the national averages. But while economic growth and development is going gangbusters, the same can’t be said for housing supply. Quite the opposite – as in Auckland, there is a major shortage. That shortage is particularly acute in the rental market. The scarcity of rental stock has contributed to an increase in rents. According to Trade Me Property, the city’s median weekly rent was up by 6.5% on last year to $490 in October. In that sense, the market is good for rental property owners. But Tahau has had better luck with her yields: her properties return 6.1%, 6.3% and 6.4% respectively. They may not be amazing but the overall strength of the rental market was one of the main attractions for them, she says. Alongside the city’s traditional rental market, there are new opportunities awaiting investors. There’s been much talk about the surge in the number of rentals being put up as short term rentals on platforms like Airbnb. But Lusby and Tolley agree that works best in beachfront areas, like Mt Maunganui. Rather they both point to the emerging student rental market as presenting genuine opportunities for investors. Picking where to buy in Tauranga requires investors to do some careful thinking about their strategies. In Tolley’s view, it is critical for an investor to establish who their target tenant market is when considering suburbs. Barnes and Lusby also pick Matua, Bethlehem and Otumoeai as popular with good quality tenants. Lusby says that Mt Maunganui is the most expensive area to buy in but it is where you get the best rents. The fact that Tauranga’s market is moderate on the yields front means it pays for investors to find value-adding opportunities to improve their capital gains prospect. All our interviewees believe the city offers good scope for such renovation work. But there are caveats that come with it. In Barnes’ view, the key is to buy a property with a twist like a granny flat or a minor dwelling on the site, or scope to add one. That’s because multiple income stream properties are always better for yields.